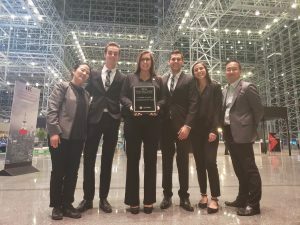 The 4th Annual Smith Travel Research (STR) Hotel Market Analysis Competition was held in New York City (Jacob K. Javits Convention Center) on Sunday, November 11, 2018. The School of Hospitality Business was represented by four senior students: Jason Klee (BA ’19), Mackenzie Sappe (BA ’19), Jake Davidson (BA ’19), and Morgan Wheeler (BA ’18). Mentored by Dr. Seung Hyun (James) Kim, the students prepared a detailed analysis of the Minneapolis-St. Paul hotel market for the competition. This included review of its overall market characteristics, demand drivers, supply-demand analysis, comparable city analysis, and trended data and summarized key takeaways for the audience. Pictured: Dr. JaeMin Cha, Jake Davidson, Mackenzie Sappe, Jason Klee, Morgan Wheeler, and Dr. Seung Hyun (James) Kim. The MSU team received third place in the competition between universities from across the country. There were 33 teams represented: 24 undergraduate student teams and nine graduate student teams, including six international. This year competition was more intense than prior years for this undergraduate team. Eight teams competed within three separate rooms and only two teams from each room advanced to the top six finalist teams. The MSU team had only a 10-minute break after the finalist announcement before the final round of presentations began (they were selected to compete first among the six finalists). It was certainly an amazing experience for the 2018 MSU STR Team. The next STR Student Market Study Competition will take place in Hong Kong (an international competition scheduled for the end of May 2019). STR Student Market Study Competition is an annual competition hosted by STR, a leading global provider of competitive benchmarking, information services, and research to the hotel industry.